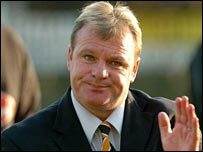 Boston United manager Steve Evans and his assistant Paul Raynor have resigned from the club with immediate effect. The Pilgrims went into administration during the final game of this season and were relegated to the Conference. Evans told the club's website: "This was a hard decision but, given events over the last few weeks and months, it was the only decision we could make. "We have families to support and we need to be given at least some chance of doing the job we're employed to do." The management duo had been in talks with Pilgrims chairman Jim Rodwell over the last few days. Rodwell told the club's website: "It is with great reluctance that I accepted the resignation of Steve and this was quickly followed by that of Paul. "However, given our current situation, I can understand why they have left with immediate effect." Evans was originally appointed manager of Boston in October 1998 following the resignation of Greg Fee. Evans led Boston United to promotion to the Football League in April 2002 but left the club at the end of an FA investigation. However, he returned to Boston in March 2004 and worked his magic again as the Pilgrims reached their highest League standing of 11th position in the fourth tier. Raynor, a former Boston player, rejoined the club in February 2004 to take up the role of first-team coach. He was then promoted to assistant manager when Evans returned to the club.